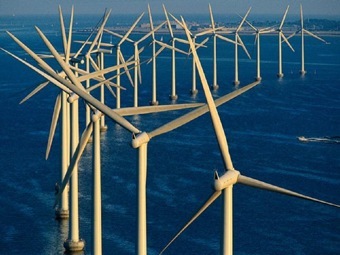 The U.S. has lagged behind other developed countries in capturing offshore wind for electricity.. The U.S. has lagged behind European countries in capturing offshore wind for electricity, but a spate of recent studies suggest that a bigger push might be in order. The latest, from Stanford civil & environmental engineer Mark Jacobson concludes that off the East Coast alone is enough moving air to meet a third of the entire nation’s energy needs. Running out the string quite a bit further, studies from Stanford and Lawrence Livermore National Lab point to a breezy bounty offshore and at higher altitudes that could theoretically power the planet, perhaps as soon as 2030. Of course, that would take four million powerful turbines. “California has a tremendous offshore wind resource,” said Habib Dagher, who joined Jacobson and other experts on the program. Dagher, who runs the DeepCWind Consortium at the University of Maine, calculates that within 50 nautical miles of the California coast is about 587 gigawatts of untapped energy, the equivalent of more than 500 commercial nuclear power plants. The tricky part will be tapping it. The ocean depths off of California would likely require a whole new generation of turbines that ride the waves like big buoys. In March, Dagher’s group will place an experimental floating turbine off the Maine coast. The scale-model test will offer insights into how giant six-megawatt turbines would perform offshore. He says research & development funding doesn’t support a bigger push right now, that the DOE wind research budget hovers between $70-80 million per year, “very small” compared to what much smaller countries are spending. Dagher says the U.K., for example, is aiming to get a quarter of its electricity from offshore wind farms by 2020. 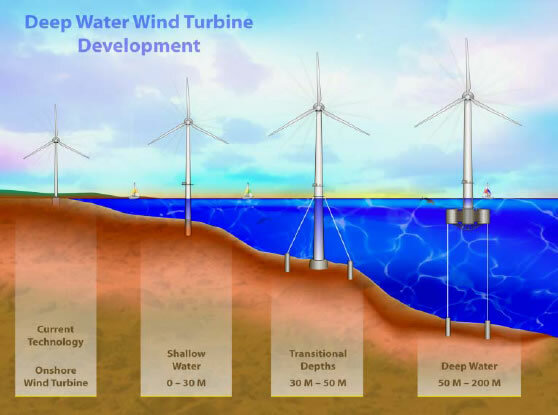 Different approaches to offshore wind turbines could include "floating" turbines, which might be combined with tidal or wave energy. Dagher says that while conventional onshore wind farms are already cost-competitive with some fossil fuels, offshore development is about twice as pricey.